The other day on Facebook, I spotted an adorable school bus cake made by the talented Melissa of My Cake School. I was instantly inspired and knew her cake could be converted into a cute cookie:) I had even picked up a packet of foam buses (used for scrapbooking) in the dollar bins at Target, which ended up being the perfect template for the cookie. Though obviously not as big as the cake, this is a larger than average cookie, measuring 9 by 5 inches (6 inches counting the wheels). It would be a perfect treat to share with the whole family, or with friends. 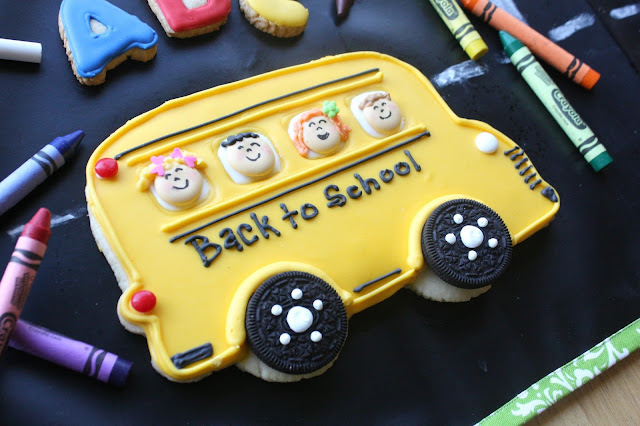 Wouldn't it be fun to surprise your kids with this giant cookie when they come home from school? I think so. Another thing I came across on facebook recently is Scribble Linens*. This company has an awesome product! They sell reversible chalk cloths, one of which is pictured above as the backdrop for my cookie. Sarah of Scribble Linens kindly sent me a placemat and a table runner (pictured). I was so happy to receive them. The reversible fabric is very pretty, and the chalk cloth easily wipes clean! Unfortunately, I failed to take a photo of the fabric side of the table runner, but hopefully you can get the idea from the edging. I will feature the placemat in another post very soon, and then I can add the backside of the table runner also. Be sure to check out the Scribble Linens site for more information and creative suggestions for use. Thanks for your generosity, Sarah! 2. Mix up the royal icing. Set a small portion aside for the black details, another small portion for the white details, and another for the ivory. Mix the remainder with yellow soft gel food color(I added a drop of orange to the yellow to achieve more of a school bus yellow). 3. Roll out the dough about 3/8-inch thick. 4. Place a bus template on the dough and cut around it with a sharp knife, making as many buses as you want, or just one. 5. Transfer to a baking sheet. 6. Bake at 350 degrees for about 15 minutes. 8. 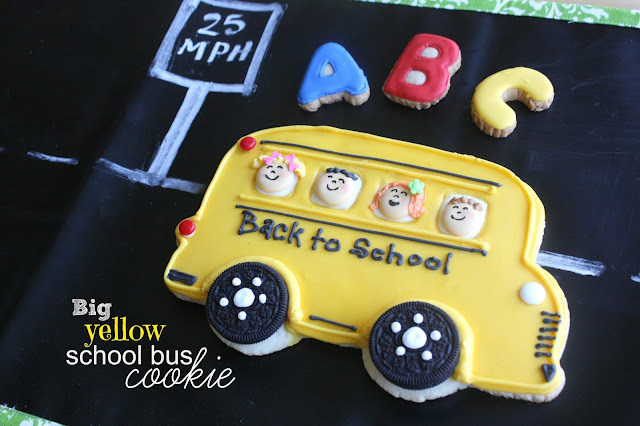 Outline the bus with the yellow icing and a #3 tip. Leave open space for the windows. Let dry for about 15 minutes and then fill with the yellow. Let dry for a couple of hours. 9. Put a drop of ivory food color gel in some of the reserved royal icing and mix well. 10. With a #3 tip, pipe circles onto parchment (or wax) paper and let dry completely 6-8 hours. 12. With the white icing, fill in the windows, detail the cookies, and add a headlight. 13. Using royal icing, add the red hots as rear lights and the Oreo cookies as wheels. 14. Let bus dry overnight. 15. 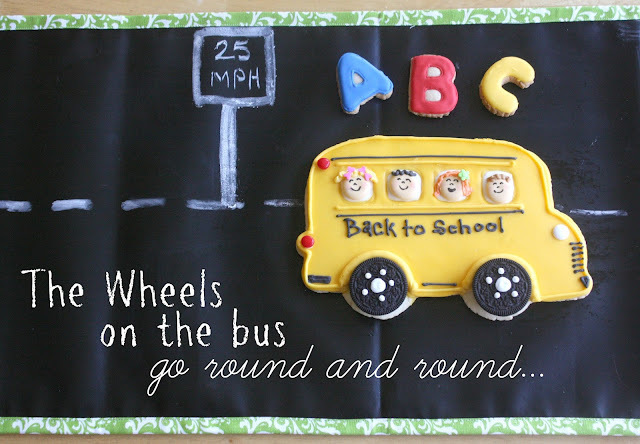 With a #2 tip and the black icing, add the wording on the bus and the other black details. 16. Using a black food marker, add face details to all of the ivory circles. 17. Create cheeks by applying pink edible marker, and then wipe some off as desired. 18. Melt the various candy melts according to package directions and put each color in a decorating bag with a #2 tip. *I had candy melts on hand, but you can opt to use royal icing for the hair. *Though I was given the Scribble Linens products, I was not compensated in an way, and the thoughts are my own regarding the product(s). I am dying over the cuteness of those little faces in the school bus windows! Hallo Sue! A Hi from Italy! I find your blog through Bubbles and sweet. Your school cookie is amazing!! Really fantastic! Wow -- those wheels are too cute! What a creative way to incorporate Oreos. 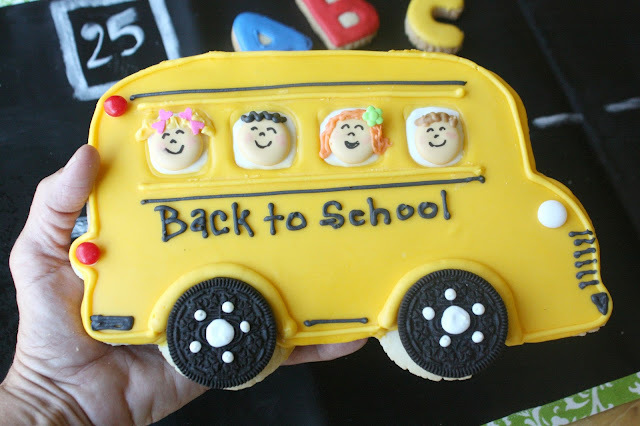 I'm really impressed by these school bus cookies! What a fabulous cookie! I am not sure I would share it though. The kiddie's faces are just too cute. Love the linens. Wouldn't they be fun to have the kids play with! The faces came out wonderfully! Really cute! Also, that cutter is precious! This cookie makes a statement! I love it. My grand kids would love the chalk mats--Christmas is coming up! Wow, that really is one BIG school bus! And those smiling kids in the windows are amazing!! Such cute kids in your cookie bus! So so adorable. I love the little faces as well, I'm smiling thinking about them having a good time as they are bumping along on their oreo wheels. I don't even know what to say. ADORABLE!!! You are amazing. This would be an amazing first day of school treat for the teacher too. So dang cute!!! LOVE it! so clever ideas for the tires!